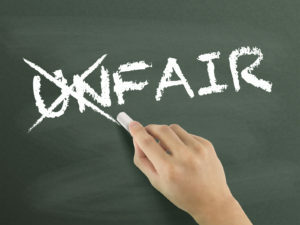 Home » Posts Tagged "HB 2179"
Once again teachers were told that they would be denied due process protections in Kansas when Education Committee Chairman Clay Aurand announced that he had no intention of working HB 2179 after a hearing. This was the first opportunity for this legislature to demonstrate that they respect, honor, and value Kansas teachers but thanks to Rep. Aurand, the members of the House Education Committee were denied that opportunity. After a hearing where KNEA, AFT, the Kansas Organization of State Employees, and Kansas Families for Education stood as proponents of the bill while only KASB and Dave Trabert’s Kansas Policy Institute opposed it. KASB was quick to point out that they did not support repeal of the due process law in 2014 but they outright opposed this bill to reinstate it. KPI supported KASB. Opponents like Rep. Willie Dove and Clay Aurand said they never heard from teachers who cared about due process. Aurand asserted that teachers would prefer more money over job security. Of course, here in Kansas, teachers get neither one. The questions from members of the committee showed that there were enough committee votes to pass the bill. It was then that Aurand announced he had no intention of working the bill. Rep. Jim Ward, sitting in for Rep. Valdenia Winn, made a motion, seconded by Rep. Jarrod Ousley to overrule the chairman’s decision and bring the bill up for action. Knowing the votes were there, Aurand immediately adjourned the committee denying the members the chance to vote. Once again the minority wins. They didn’t have the votes to repeal due process in 2014 until they locked the members in the chamber, using strong arm tactics to coerce a 63rd vote. Today, when the votes were there to pass the bill out of committee, the Chairman threatened to wield absolute power and adjourn the hearing. He then made good on his threat. Yes, a sham bill hearing. And legislation that would benefit Kansas teachers is quashed. The whole situation is a shameful display of disregard for Kansas teachers. KASB says they opposed repeal of due process but they also oppose reinstating it. How can they have it both ways? If they believe teachers should have due process protections, then they should demonstrate it through their actions and not once again by simply standing in opposition. This is not over. We intend to keep up this fight this year. Many new and returning legislators ran on their commitment to public school teachers and specifically to reverse what happened in 2014. We know they are not ready to give up and we stand together with our allies – The Working Kansas Alliance, Kansas Families for Education, AFT, KOSE, and other organizations to see that teachers in Kansas get the recognition the richly deserve. You can do your part. 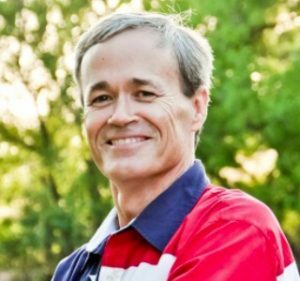 Tell Clay Aurand that teachers deserve due process protections. You can leave him a phone message at 785-296-7637 or email him at clay.aurand@house.ks.gov. WE KNOW YOU’RE ANGRY BUT PLEASE TEMPER YOUR ANGER IN ANY COMMUNICATIONS. Remember, school board elections are just around the corner. Electing board members who support public education fully, including its teachers, is vital. HB 2179 would re-enact the teacher due process or fair dismissal law that was in effect in Kansas prior to 2014. Bill has 45 bipartisan co-sponsors. This is an opportunity for the legislature to tell Kansas teachers that the war on teachers is over. House Bill 2048, known as “Erin’s Law,” as introduced would have required training for teachers in the identification of signs of child sexual abuse. Bill amended in committee, SBOE must implement statewide standards for training teachers annually. The House Education Committee will hold a hearing on HB 2179, the bill that restores due process protections to Kansas teachers. In the 2014 legislative session, the repeal of this statute was never proposed as a bill. The proposal was never subject to a public hearing. And the proposal did not have broad legislative support even in a legislature that would be considered far more conservative than now. The repeal of the due process statute came as a Senate floor amendment to an education budget bill in the wee hours of an April morning. And by wee hours, we’re talking about past midnight just for clarification. Other policy provisions that had failed either in committee or on the floor as stand-alone bills were also dumped into the education budget bill. The conference committee negotiators who were among the minority of legislators who supported these ideas, refused to remove them. They wound up in the education budget conference committee report brought before the full House long after midnight of a second 22-hour day. At that time, the education bill failed to get the needed 63 vote majority to pass. A call of the House was put on and the members remained locked in the chamber for several hours until the 63rd vote could be pressured into casting a vote against conscience. This year HB 2179 would right the wrong done to teachers at that time. The bill has 45 bipartisan co-sponsors. We believe this is an opportunity for the legislature to tell Kansas teachers that the war on teachers is over. It is time to return to respect for the teaching profession and HB 2179 is the first step. House Bill 2048, known as “Erin’s Law,” as introduced would have required training for teachers in identification of signs of child sexual abuse. As mandatory reporters, it is important that teachers know what to look for. The bill was advanced on a voice vote and will face a final action vote on the floor tomorrow. Due Process, Health Care and EDUCATION CUTS! Rep. Clay Aurand, Chair of the House Education Committee, has announced that a hearing has been scheduled for HB 2179 which would restore due process protections for Kansas teachers who have completed a probationary period. The bill re-enacts the law as it was prior to repeal in 2014. 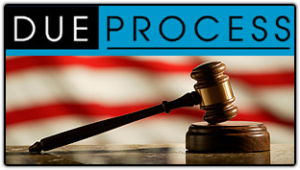 Due process was repealed in 2014 without ever having been introduced as a bill and without any public announcement or hearing. The repeal was enacted after midnight as a floor amendment to a must-pass school funding bill. With it attached to the finance bill, the bill was unable to receive the needed 63 votes to pass until House leadership enacted a call of the House under which members are locked in the chamber indefinitely. Eventually – about 4:00 am as we recall – a 63rd vote was gained through pressure and exhaustion. HB 2179 has 45 legislative co-sponsors from both parties. We look forward to a fair hearing and having a vote on the bill in committee next week. The Division of Legislative Post Audit today released their study on the feasibility of consolidating school district health benefit plans into one mega-plan similar to the State Employee Health Plan (SEHP). The idea was raised as a possible cost saver in the Alvarez and Marsal efficiency study. They suggested a savings of about $80 million per year. Finding himself short of cash in setting a budget, Governor Brownback leapt on the idea and called for this to happen by January 1, 2018. Unfortunately for the Governor, the LPA indicates that even if they decided to move forward, it could not be done so as to gain any savings in 2018. Beyond that, the savings are lower in the LPA study. They suggest perhaps $38 million in efficiency savings and another $25 million by shifting costs onto employees. What they did was look at what happens if you put school employees in a plan modeled on the SEHP. Doing this would significantly reduce benefits for school employees by raising deductibles, increasing co-pays, and increasing the out-of-pocket maximum per year. The state would then “claw back” those savings leaving school districts with less budget authority. The savings garnered by reducing benefits would not go to the employees as pay raises but to the state general fund presumably to shore up Brownback’s reckless tax cut program. Passage of a plan to make this consolidation happen is basically a cut to school employee compensation across Kansas by $25 million. There will be a hearing on a bill to enact the consolidation on Monday. KNEA will be there to oppose the bill. CLICK HERE to read the full LPA report. CLICK HERE to read the healthcare report highlights. The full Senate will convene tomorrow to vote on two bills. Senate Bill 27 would cut education funding by $154 million – $128 million from K-12 and another $23 million from higher education. Their tax bill, SB 147, would raise income tax rates for all Kansans, repeal the low-income tax exemption for those earning less than $12,000/year, and repeal the LLC loophole but does nothing to end the glide path to zero which is the root of future revenue declines. There is much debate about what it would raise – perhaps $280 million in 2018. The problem with this bill is that it does not go nearly far enough in solving the revenue crisis facing Kansas. The budget holes Kansas now faces in 2017 and beyond are enormous. Most analysts believe the state will need to raise at least $580 million just to break even and not accounting for any pending decision in the Gannon school finance lawsuit. Kansas NEA has released a statement along with USA/KS, KASB, KSSA, and others calling on the Senate to vote NO on SB 27 and to send SB 147 back to committee for more work. CLICK HERE to email your Senator. SB 76 seeks to create fee caps and require reciprocity with other states. Of greatest concern for KNEA is blanket reciprocity with other states where requirements and standards for obtaining a teaching license are far lower than in Kansas. KNEA believes that the agency best equipped for ensuring licensing requirements is the State Board of Education. HB 2148 seeks to centralize procurement through the State Department of Administration. Bi-Partisan support growing for bill (HB 2179) to restore due process rights for teachers. CALL SENATORS MORAN AND ROBERTS AND ENCOURAGE THEM TO STAND WITH KANSAS PUBLIC SCHOOLS. The Senate Federal and State Affairs Committee today held a hearing on Senate Bill 76 which would cap fees collected for all occupational licenses, waive those fees for certain people, and require automatic reciprocity of licenses with other states and units of government. Supporters of the bill generally expressed their support for the provisions waiving licensure fees for low-income and military persons without addressing the other aspects of the bill. 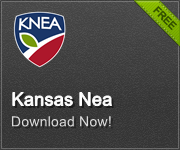 KNEA joined a long list of opponents including the State Board of Education, the College of Education at Emporia State University, USA/Kansas, the Kansas School Superintendents Association, the Board of Healing Arts, The Pharmacy Board, and the Board of Cosmetology. All the opponents expressed concern about the fee caps and fee waivers. Fee waivers had some support but only if there was funding provided by the state to ensure that licensing agencies can efficiently do the work necessary to make sure candidates qualify for licensure. Fee caps were opposed often because in some professions higher fees are used to fund continuing education programs. Of greatest concern was the requirement that licensing agencies would have to accept a license from another state or municipality without regard to the actual standards applied by the other state. In education, state standards for a teaching license vary widely around the country. Kansas has held license applicants to very high standards and would not be well-served if forced to license anyone who held a license regardless of where that license was issued. Further, this legislation usurps the authority of the State Board of Education to manage the licensure of the education profession. Committee member Sen. Rob Olson (R-Olathe) suggested that the bill be sent to a subcommittee so that it could be more thoroughly examined. Chairman Jacob LaTurner seemed to agree and announced that the committee would not rush this issue and instead take their time for fully examine all the ramifications. The House K-12 Education Budget Committee held a hearing today on HB 2148, a bill that would require all school districts to handle procurement of goods through a centralized service in the State Department of Administration. Generally, the Department looks at what items are to be purchased and then negotiates agreements with vendors to provide those items. The Alvarez and Marsal Efficiency study suggested that this had the potential to save money on school expenditures, however, the study also suggested that a number of changes would need to be made in the Department to handle the additional work that would come from such consolidation. There are other considerations to take into account. For example, local school districts seek to be good partners with the local community and often buy locally. Local businesses will often try to beat the price available through the state system. Central procurement could have the unintended consequence of harming local businesses. Bipartisan Bill to Restore Teacher Due Process! House Bill 2179 is not a committee bill. It is a sponsored bill meaning legislators sign on as co-sponsors and their names are listed on the bill. House Bill 2179, which would restore the teacher due process law that was repealed at 4:00 am without ever having a hearing in 2014, has been introduced and co-sponsored by 45 Representatives: Crum, Stogsdill, Alcala, Arnberger, Ballard, Bishop, Burroughs, Carlin, Carmichael, Curtis, Deere, Elliott, Ellis, Finney, Frownfelter, Gartner, Good, Henderson, Highberger, Hodge, Holscher, Kessinger, Koesten, Kuether, Lusk, Lusker, Murnan, Neighbor, Ohaebosim, Ousley, Parker, Phelps, Pittman, Ruiz, Sawyer, A. Smith, Tarwater, Terrell, Trimmer, Victors, Ward, Weigel, Whipple, Winn and Wolfe Moore. Is your Representative on the list of co-sponsors? If yes, please take the time to send a message of thanks. Now we wait for a hearing in the House Education Committee. DeVos Nomination on the Razor’s Edge: Where’s Jerry Moran? 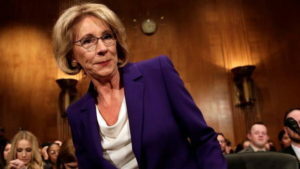 While Donald Trump’s nominee for Secretary of Education has been moved out of committee on a 12-11 vote, she is now subject to a vote of the full Senate for confirmation. Two Republican Senators, Susan Collins of Maine and Lisa Murkowski of Alaska, have announced that they will not support the DeVos nomination. Along with 48 Democrats, that puts the numbers at 50-50; breaking ties goes to the Vice President, Mike Pence. That means we need more Republicans to put schools ahead of Trump’s agenda. We wonder where Jerry Moran will be when that vote takes place. And that’s your job right now! Jerry Moran needs to know that DeVos is bad for Kansas schools. Call Moran’s office and tell him to put Kansas ahead of partisanship and vote NO on Betsy DeVos. Let Jerry Moran know that Betsy DeVos is bad for rural communities and wrong for special education!